Project supported by the Australia-China Council, UNSW at ADFA, CAS Institute of Soil and water Conservation in Shaanxi, Yangling and the Hanzhong Museum. The Qinling (秦岭) is a mountain range in Shaanxi (陕西) that divides the climate, environment and geography as well as the history and archaeology of the northwest from the southwest of China. The temperatures and rainfall to the south of the Qinling are governed by the annual monsoon which brings warm moist air from the south in summer and to the north of the Qinling the cold dry air from the Siberian plains dominates in the winter. 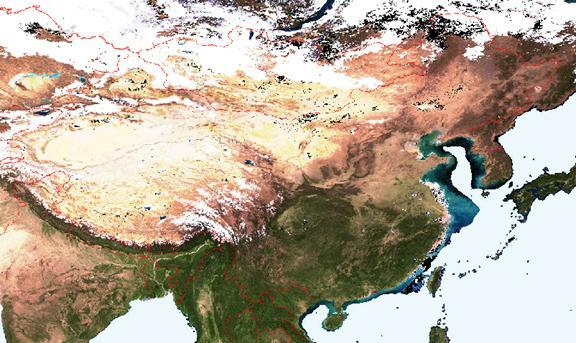 The mountains modulate the climate and the Qinling marks the boundary between the more moist and warm predominantly rice growing south and the dryer (in summer) and colder (in winter) predominantly wheat growing north. The Qinling created challenges for interchange and communication between cultures that developed in present day Shaanxi and Sichuan (四川). The project outlined here is about the communications, interchange, trade and traffic that developed across the Qinling in ancient times. It involves links between three relatively protected valleys that have played significant roles in China’s history and the pathways taken by the linking roads through the mountains that surround them. To the north, the Wei River valley, or “Guanzhong” (关中) that stretches between Xi’an (西安) in the east and Baoji (宝鸡) in the west is especially rich in agriculture and history. South of the Guanzhong past the Taibai mountain range (太白山) is the Han River (汉水) valley with the historical city of Hanzhong (汉中) at its centre. 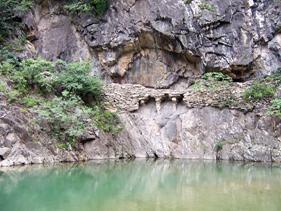 South across the Bashan (巴山) mountain barrier lie the plains of present day Sichuan or the ancient region of Shu (蜀). The roads through the Qinling and Bashan mountains have therefore often been called the Roads to Shu. The mountains of this region are steep and dangerous and the few natural pathways through them are still challenging for modern engineering technology. Nevertheless, the journey had its rewards. Much of the silk that travelled the Silk Road (丝绸之路) first crossed the Qinling to reach the northern roads to the west. 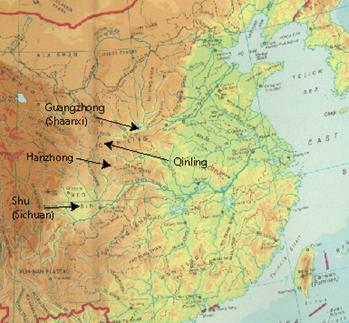 However, the first recorded roads across the Qinling were the military roads built by the state of Qin (秦, during the Warring States 战国 period) to support their conquest of Shu for its vital resources and as a strategic move against its rival Chu (楚). This happened in about 316 BCE and led to the establishment of the Dujiang irrigation area (都江堰灌溉系统) that made Shu a “rice bowl” for Qin and fed its armies. The irrigation area and much of its original engineering is still in operation. Through the Qin and Han dynasties (秦汉代) and through to the Tang (唐代) the roads to Shu were built, destroyed, rebuilt and repaired but the traffic generally continued one way or another and still does today. But if traffic through high mountains and steep valleys were not enough, the roads to Shu involved something extra special. To make roads through the narrow and dangerous valleys where floods, landslides and even wild animals made it hard to travel the ancient road builders created a style of road that was unique and effective. These roads were “plank” or trestle roads in which were built on the sides of the valleys and linked the more open areas through narrow and dangerous passages. The Plank Roads were described by Joseph Needham (1971) as “The greatest engineering work of Qin/Han roadbuilders” and Lecomte in the 17th century wrote: “The Road from Si-ngan-fou (Sian) to Hamtchoum (Hanchung) is one of the strangest pieces of work in the world. They say, …, upon the side of some Mountains which are perpendicular … they have made a sort of Balcony without rails, which reaches through several Mountains in that fashion”. 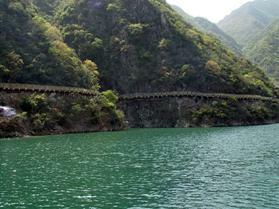 The Plank Roads are strongly embedded in the history and culture of China. In history, as described in Sima Qian’s “Records of the Grand Historian” (司马迁, "史记"), after the fall of Qin and at the instigation of Zhang Liang (张良), Liu Bang (刘邦) “burnt the Baoye plank road” (烧绝褒斜栈道) to convince (deceive) the hegemon of Chu, Xiang Yu (项羽) into believing that he had no intention of returning from his kingdom in exile of Shu, Ba and Han to conquer China. Liu Bang defeated Xiang Yu and went on to found the first major and long lasting Chinese dynasty. During the Later Han the Shu roads were major pathways for armies (de Crespigny, 1984) and as the Han broke up, the Shu Roads were the routes by which Zhuge Liang (诸葛亮) and the Shu armies travelled to attack the kingdom of Wei as they tried to restore the Shu Han king Liu Bei (刘备) and his heirs as the inheritors of the Han. Then, in the “Romance of the Three Kingdoms” (三国演义) and other stories these histories moved deeply into the literature, traditions and culture of China. In following centuries, people, trade, communications, animals, information, ideas, armies and emperors continued to use them and even lychees were brought along the Shu roads to satisfy the needs of Yang Guifei. At the centre of the Qinling traffic stood the rich and fertile plain surrounding the Han River and its major city Hanzhong. The upper Han River valley was home to Chinese civilisation since Neolithic times and maintained a central position down to the present day as a privileged and well protected area between north and south. Its temperate climate and civilisation have led to it being called “The little Yangse River of the Northwest” (西北小江南) and in more ancient times “Yu Pen” (玉盆) or the precious basin. This was where the first Han emperor Gaozu (Liu Bang) had his palace – at the Hantai (古汉台) where today this history and culture is recorded by the Hanzhong Museum (汉中博物馆). The paths for the roads to Shu as well as from Shu to Guanzhong were strongly determined by the terrain and its opportunities and constraints as well as by the ingenuity of human engineers and determination of armies, conquerors, rebels and Emperors. They have a strong geographical aspect, determination and relationship and can therefore be profitably represented in the framework called “3S” in China. “3S” stands for Remote Sensing (usually from satellites), Geographic Information Systems (GIS) and the Global Positioning System (GPS). The following image shows the “3S” in one picture. 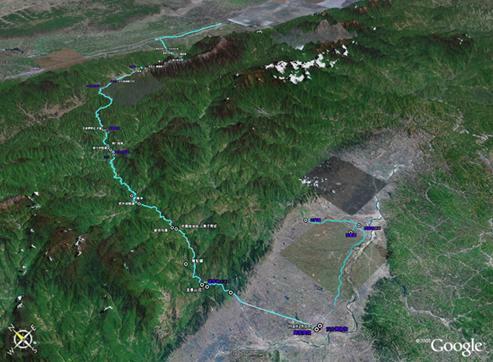 It is a Google Earth view of the Qinling mountains with the Guanzhong in the north (top) and Hanzhong in the south (bottom). The track plotted on the image is the path taken by driving along a modern road close to one of the ancient Shu roads and where some of the remaining relics were mapped by GPS and marked as way points. The terrain is provided by the SRTM layer of Google Earth and the information attached to the way points and tracks can be interrogated from the software. There is also in this image the record of a visit to two of the many ancient sites near Hanzhong – the tomb of Han period diplomat Zhang Qian (张骞墓) and the ancient irrigation engineering site at Wumenyan (五门堰). There are many cases where an established geographic framework for ancient relics and roads can help the task of conservation and preservation. The framework needs to be at the appropriate scale and the value can grow as geographic and non-geographic information is collated onto the same base. In addition, in these regions where the terrain and associated climates play such a dominant role in the record of history, the value of an accurate geographic framework to answer questions and resolve remaining mysteries concerning possible pathways and associations adds another dimension to the pursuit of research into the Shu Roads. Bringing the geographic information of ancient texts and maps into a consistent modern mapping framework identifies errors and ambiguities and also generates new associations and ideas. 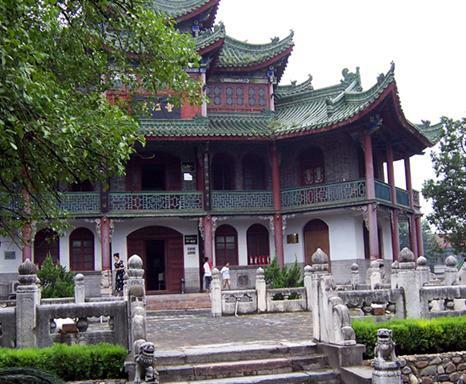 The objectives of this Australia-China Council (ACC) supported project are to demonstrate how history, terrain and 3S may be integrated and used as a tool so that people at the centre of the history, its conservation and preservation – the Hanzhong museum – can access and use it for their work and to generate new ideas. The aims include bringing along associated technologies such as document and photograph scanning to support the integration of a wide variety of information onto a base that is geographic, electronic, historical and cultural. It has already started and is planned to finish by mid-2008. To promote the development of interactions between the Hanzhong city governments with Australian groups to promote development of ecological, historical and adventure tourism. The Project will proceed in two Phases. Phase 1 will organise a Symposium on Shu Roads (with special emphasis on the Plank Roads) at which the opportunities and technologies provided by 3S technologies will have a specific focus. The Symposium will also help define a specific pilot project. Phase two will carry out the pilot project identified in Phase 1 to demonstrate the application of 3S technology to Plank Road research. The first Phase of the Project Plan also involves visits to China with meetings in Yangling and Hanzhong in October and November 2006 to establish the detailed activities of the Project and to plan and promote the Symposium. Visits by Chinese representatives to Australia in 2007 will develop links, visit Museums and academic groups and promote the Symposium on Shu Roads (with special emphasis on the Plank Roads) and advance the implementation of the second phase. The Pilot Project of Phase 2 may be refined and have additional detail following the Symposium in 2007 but will involve the accurate mapping of one or more Shu roads, the GPS location of sites and records of condition of relics and the integration of information from a number of sources. This information will include satellite data, terrain models, ancient and modern maps, photography and ancient texts. When combined they will be used to support conservation, preservation and historical research. Needham, J., Wang, L. & Lu G.D. (1971). Science and Civilisation in China. Volume 4. Physics and Physical Technology, Part III, Civil Engineering and Nautics. Han Empire. Faculty of Asian studies, Australian National University, 1984. David Jupp (2005). The Baoye Road to Shu – from Guanzhong to Yu Pen (Visit to the Baoye Road (褒斜道) in 2005) as PDF File.